This past week I attended Hewlett Packard Enterprise ‘s Discover 2017 in Las Vegas with fellow Moor Insights & Strategy analysts Mike Krell (IIoT) and Rhett Dillingham(cloud software/services). Discover is HPE’s premier, semi-annual conference and the company’s opportunity to set its narrative, announce new products and services, and showcase the work it has been doing with its partners. I follow HPE closely, and always do my best to make the conferences. Here’s my coverage at Discover Las Vegas 2015, Day 1 and Day 2 2016. The General Session is the typically a good place to start when looking for the overall themes—this year, it mostly centered around simplifying Hybrid IT, the newly announced 10thgeneration of HPE’s ProLiant server portfolio (which I actually recently wrote a column about here), and a sneak-peek at “NewStack”, a compelling-sounding, managed hybrid-IT service. Given where HPE is and what enterprises are asking for, these were the right things to focus on. The company’s mid-term future banks on Synergy and NewStack, and IoT Edge is gravy, so it had to nail all three. Here’s my rundown of the event keynote and some of the big takeaways. How the challenges and opportunities created by this “new world” are in alignment with HPE’s Hybrid IT and Intelligent Edge strategy. What HPE and its partners are doing to help customers accelerate innovation and time-to-value in an “age of disruption”. Whitman emphasized HPE’s goal of making Hybrid IT simple, with HPE Synergy—the company’s (and world’s) first and only composable infrastructure option which was rolled out earlier this year. We have researched Synergy since inception and our latest paper is here. She also mentioned their recent strategic acquisitions in this arena—SimpliVity, the hyperconverged data management platform, and next-generation flash storage maker Nimble. 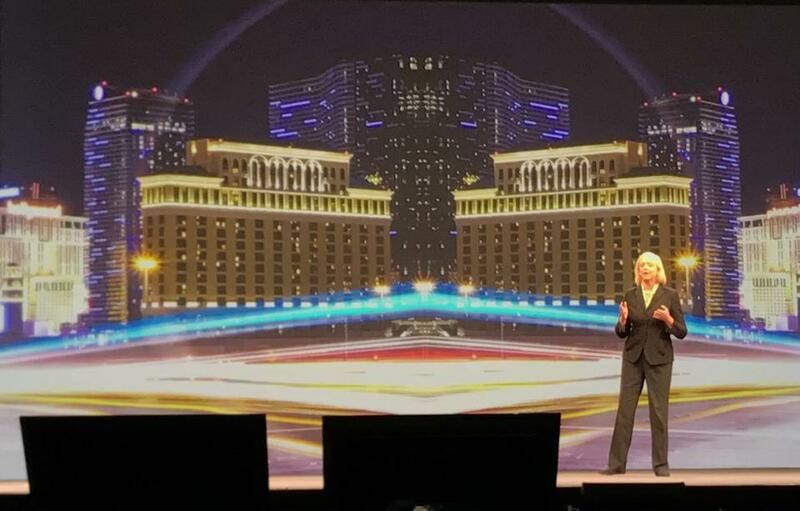 Whitman said that with SimpliVity, Nimble, and 3Par, HPE will be able to bring customers all-flash datacenters capable of scaling up at a fraction of the cost of using public cloud. HPE has done well as of late in all-flash with 30% revenue gains last quarter. I’m very interested to see how HPE does in the future storage and hyperconverged as soon as Nimble and Simplivity are integrated. Right now, it’s a two-horse storage race and HPE is #2. Whitman went on to talk about the intelligent edge, reiterated successes in Hewlett Packard Enterprise ’s Aruba product line (30% growth each quarter for seven quarters) and Edgeline portfolio, and mentioned HPE’s acquisition of SGI and what it brings to HPE in high-performance compute, data analytics, and data management solutions. These were all more strategic discussions to indicate what the future may hold for HPE. Whitman then moved on to services, and talked a little bit about HPE’s newly re-branded and relaunched services unit, HPE Pointnext. Pointnext’s goal, according to Whitman, is to make Hybrid IT simple by answering the “how,” and supporting/enabling successful digital transformations. People still think that HPE jettisoned all services with the divestiture of HPE Enterprise Services, but this is far from accurate. In my words, HPE spun out the legacy services and kept the ones enterprises are most interested in like shifting to hybrid IT, edge compute and IoT. Pointnext has 25,000 employees who work on 11,000 projects a year in 80 countries. Far from getting out of services. 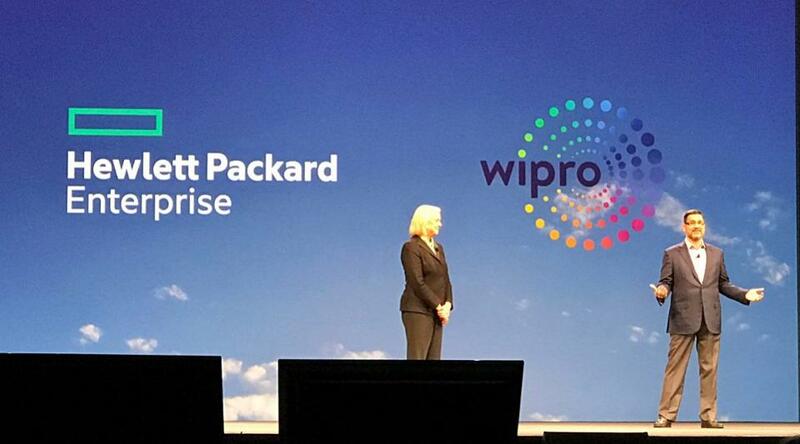 Whitman then pivoted to the first partner testimonial of the day, one of HPE’s SI partners, Wipro. Wipro’s CEO Abidali Neemuchwala took the stage to talk about the role of Wipro and HPE in simplifying IT and driving digital transformation. He talked of the necessity of elimination—simplifying IT by getting rid of the applications, processes, and hardware that customers just don’t need anymore. Neemuchwala went on to say that what Wipro cannot eliminate, gets hyper-automated, and what Wipro can’t hyper-automate, the company believes will move to cloud-sourcing. One of the ways that the two companies are working together is by combining Wipro’s infrastructure-as-a-service portfolio with HPE’s Flexible Capacity consumption-based IT solutions to create a new go-to-market agreement. HPE is very proud of Flexible Capacity—customers only pay for what they use, and can leverage a buffer to scale up and down on demand. These measures will help customers save a lot of money in the long run by cutting back on over-provisioning. I’m very interested to see the results of this tie-up to determine if these were on-stage platitudes or revenue drivers. Flexible consumption models are very important in the age of public clouds and Moor Insights & Strategy believes these kinds of consumption models reduce the public cloud advantage. I’m interested to see how this plays out given the pubic clouds newest “by the minute and second pricing” discussed at Google Cloud Next ‘17. While many believe the public cloud has eaten the world already, the reality is there is still 10X more IT purchased in traditional enterprise than cloud. People also believe the public cloud is less expensive. It’s not, at least at scale. How else could AWS make 30% operating income. Our latest on hybrid IT is here. Whitman went on to talk about the widespread movement away from public cloud back to on-prem, hybrid solutions. She spoke of the “cloud cliff”— where for reasons of either control, security, performance, or cost, a company’s public cloud is no longer the best option. We call this the “new cloud reality”. However, instead of just unplugging, Whitman said that many of these companies are looking to scale to a Hybrid infrastructure that is developer-friendly, but provides the control and security benefits of traditional on-prem solutions. She mentioned both Dropbox and Smartsheet as examples of companies successfully making the transition with the help of HPE. It’s important for HPE to roll out a new customer every show who has moved strategic apps from the public to private cloud. HPE did just that with Merck. Next, Whitman introduced Clark Golestani, Global CIO and President of Emerging Business at the pharmaceutical giant Merck. Golestani cited HPE’s commitment to quality, capability, speed, and security as key factors in the two companies’ partnership. Golestani emphasized that Merck’s strategy moving forward would not be based solely in the public cloud, but in a truly hybrid infrastructure. Golestani emphasized that the inherent regulatory constraints, privacy concerns and cost factors of the pharmaceutical industry played a significant role in why Merck settled on an on-prem, converged infrastructure solution from HPE. He also mentioned how Merck simply can’t afford any downtime in getting medicine to those who need it, and therefore can’t risk being reliant solely on the public cloud. All of these enterprise customer examples make sense and with my own conversations with big time CIOs and CEOs. 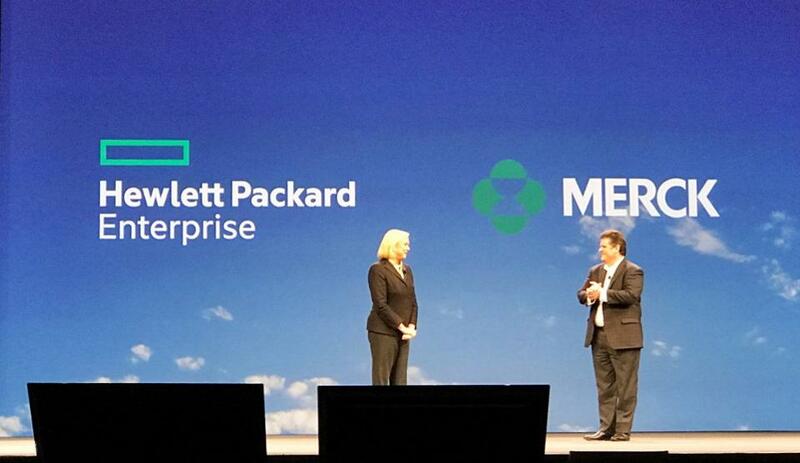 Whitman then brought Antonio Neri (Executive VP and GM of HPE’s enterprise group) on stage. Neri said that the biggest challenge in hybrid IT is the complexity. He broke HPE’s customer commitment down into three parts: helping them define their right hybrid mix (with the help of Pointnext), power their right mix (with HPE’s industry leading ecosystem), and optimize their right mix (via best-in-class consumption and delivery models). Neri nailed it, as he usually does, as he has such a good grasp of what his customers want and how to meet those needs. The new “cloud reality” is that enterprises will have a mix of traditional enterprise, private cloud and then have many public cloud partners. This will be very confusing and inefficient if not managed closely. If you want a deeper dive on hybrid IT, you can read our lateston it. Neri then introduced Alain Andreoli, Senior VP and GM of the Data Center Infrastructure Group, to formally introduced HPE’s Gen10 line of ProLiant servers. Andreoli touted Gen10 as the world’s most secure, industry stand-out server. As proof, he cited HPE’s patented silicon root of trust, which will not allow the server to boot up unless the firmware matches the root of trust’s fingerprint. HPE is the first company to incorporate this specific measure into its industry standard servers. Andreoli also explained that Gen10 incorporates active protection and recovery, turning the server into, in Andreoli’s words, an “active spy”, that is constantly monitoring for malicious behavior with the help of powerful machine learning (read more about HPE’s acquisition of next-gen security company Niara here). 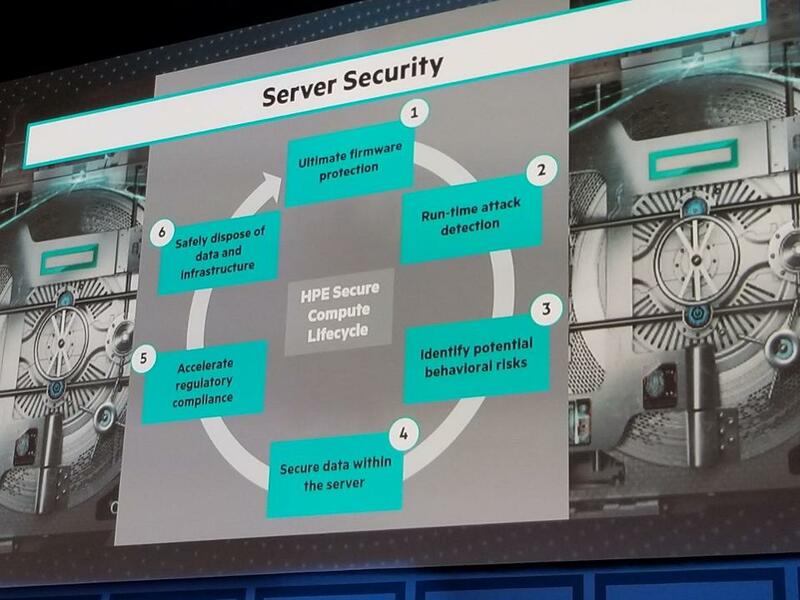 Andreoli went on to say that HPE had even built security into the end-of-life phase of servers, making it impossible to reconstruct and recover data—forever protected. You can read in more detail about Gen10 and its beefed-up security measures in the white paper we recently published here. Andreoli wrapped up by explaining that HPE’s goal is for the upgrade from Gen9 to Gen10 to be seamless—no increase in payments. HPE’s Gen10 seems exceptionally strong and I can’t wait to see everyone’s Purley updates to see how everyone stacks up. Ric Lewis, Senior VP of HPE’s software-defined and cloud group, took a few moments to laud HPE Synergy as a game-changing technology and an excellent building block for hybrid solutions. A couple new additions to Synergy were made for Gen10—Synergy 480 and 660. HPE claims these two modules will be ideal for data-intensive workloads such as financial marketing. You can find our latest Synergy assessment here. Lewis went on to give a sneak peek at HPE New Stack, HPE’s upcoming hybrid IT management platform. Lewis says New Stack will provide a simple, scalable solution that provides a unified control plane that manages across a customer’s entire hybrid estate. NewStack reportedly consolidates IT operations, developer tools, and business analytics, and is designed to inspire collaboration across IT management to accelerate digital transformation. While Rhett Dillingham, MI&S cloud and software analyst, will be weighing in more depth, I did have some very black and white NewStack takeaways. First, Newstack is Nirvana-like, literally what IT and LoB is asking for, which is a way to manage workloads through one console and track spend and activity at the same time. It cuts across traditional enterprise, private cloud stacks and incorporates many public clouds, too. I saw demos incorporating AWS, Azure, GCP, Cloud 28, Docker, Kubernetes, OpenStack, and more. I’m now onto how and when they’ll execute to this. The NewStack approach makes a lot of sense and enables a new pinch point for HPE in a world where it controls less of the software experience. Some other new advances in software-defined infrastructure to come out of Discover include HPE OneView 3.1, an update that will support the Gen10 server platform. It comes with a variety of benefits, such as improved firmware management, better composable storage capabilities, and greater support for HPE’s platforms and partners. Another announcement was HPE Intelligent System Tuning, a partnership with the Intel Xeon Processor Scalable family (Purley) that promises to modulate frequency, improve performance, and help better tune servers to line up with workloads. OneView is a very important part of HPE’s strategy, so keep your eye on it. Next, Neri introduced Keerti Melkote, Senior VP and GM of Aruba to talk more about HPE’s efforts on the Intelligent Edge. Melkote took the opportunity to introduce a handful of new products. First, he announced a new location-based asset tracking solution. Integrated into Aruba’s wireless platform, the goal of this solution is to solve the problem of misplaced, lost, or stolen inventory—for example, imagine a wheelchair in a hospital that gets stowed away in a closet somewhere and forgotten. This solution attempts to keep track of these assets so that companies don’t end up paying to replace misplaced assets. Try not to make the mistake and think that Aruba ends in mobility. Aruba starts with the mobile Intelligent Edge and HPE extends it to the Industrial IoT with HPE Edgeline Converged Edge Systems. Think of OT systems inside of IT, a potential game-changer. The other announcement from Melkote was the new Aruba 8400 (a scalable virtual switching framework, powered by ArubaOS-CX) and 2930 Core Switch series (designed for wireless LAN and IoT integration). All these announcements are part of HPE’s larger stated strategy of making Aruba the cornerstone of its IoT efforts. Keep your eye on how edge networking becomes IoT edge networking. One thing I’m always checking in on at HPE’s big shows is progress on The Machine. Now “The Machine Project”, the initiative is slowly but surely making progress, but in different ways than you might expect. The Machine isn’t going to suddenly be launched with people running their credit cards to buy it in five years. Different IP and innovations will be created and then those will be placed into future HPE products. Last month, HPE impressively showed off the latest Machine prototype, the largest shared memory system at 160TB. Heterogeneous compute with memory semantic fabrics are the future and this was an impressive sight. 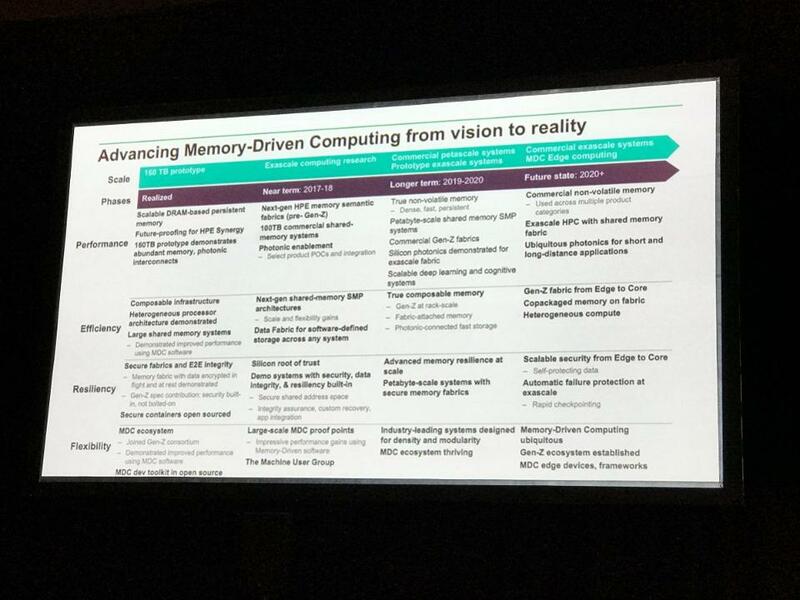 At Discover, HPE outlined their “roadmap” from now until 2020 encompassing exascale computing research, commercial petascale systems, prototype exascale systems, commercial exascale systems and edge systems with memory driven computing. The company also introduced a user’s group to facilitate sharing of algorithms, apps and discussions on architectural perspectives. HPE also introduced their first development end user partner, DZNE, where they discussed how The Machine Project architecture could help them study genomes exponentially faster. This makes sense given the massive amount of memory/storage required to do this effectively. I believe these verticals represent areas where HPE has strength or could gain strength. This is very intriguing given how so long HP was a horizontal play and just how much value that verticalization brings to an IoT and partner play. Vertical plays are more expensive, but in theory, they’re also more effective, so there’s a lot of execution to go to determine the degree of success. Given the IoT world and increasingly the hybrid IoT world is going more vertical, this all makes sense to me. It also strikes me as something HPE would have had a hard time doing when they had software, services, personal systems and printers. This is one of the benefits of a leaner HPE. I’ll be doing updates on their progress in the future. Where’s the AI and ML? You don’t need to attend 40 tech shows annually like me to know that AI and machine learning are the biggest phenomena in a decade. Machine learning will enable autonomous driving, drones, robots, virtual doctors, etc. HPE was talking a little bit about machine learning at Discover, but not a lot. I think it’s important for it to start doing that more, or potentially get left behind in the conversation. While a much smaller Discover event, I think HPE is doing a good job painting itself as one of the go-to companies to accelerate hybrid IT adoption and to attack the edge. Synergy and NewStack will define HPE’s level of success the next three to five years and the IoT edge will be gravy on top of that. I like HPE’s acquisitions of SimpliVity, Nimble, and Niara and saw good indicators of integration, but when the rubber meets the road, it will be about sales and adoption. The new Gen10 line of servers show a lot of differentiation with Security Assurance and I’m looking forward to see everyone’s Purley products before I can make the final assessment. HPE needs to strongly consider talking about if and how it attacks machine learning and AI else enterprises will get in in the public cloud or from a competitor. Given all the recent spins and churns at HPE, I think the show helped raise confidence in the company.